Uses: An ore of bismuth and as mineral specimens. Bismuthinite is an important ore of bismuth. Sprays of steel gray prismatic bismuthinite crystals radiate outward from a common attachment point in the more spectacular specimens of this somewhat rare sulfide mineral. These specimens can not help but be compared to specimens of stibnite. It is difficult to distinguish from the similar looking and closely related antimony sulfide. Bismuthinite is heavier than stibnite and on closer inspection of the crystals, there exists a noticeable difference with bismuthinite's having straighter, flatter faces. In massive form the confusion is even more pronounced, but bismuthinite is not associated with the typical antimony or arsenic minerals to which stibnite is so commonly allied. Associations of bismuthinite are varied, but combinations with the rare elemental mineral bismuth are particularly special. 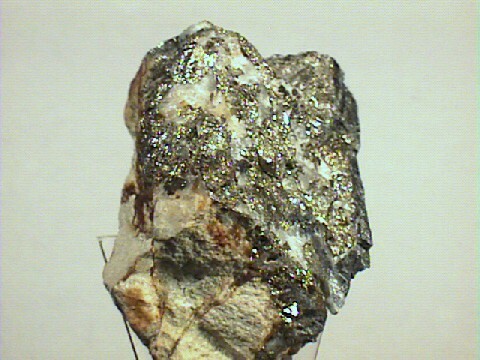 Chalcopyrite is another especially common associate. The carbonate mineral bismutite, Bi2(CO3)O2, is found as an alteration (oxidation) product of bismuthinite and often is found as pseudomorphic crystals after bismuthinite. A pseudomorph is an atom by atom replacement of one mineral by another without significant changes in the outward appearance of the crystals (pseudo="false" and morph="shape"). Color is steel gray to off-white. Crystal Habits include radiating acicular to prismatic columnar crystals. Sometimes in wonderful sprays that are similar to stibnite's crystal habits. Also granular and massive. Cleavage is perfect in one lengthwise direction. Other Characteristics: Thin crystals are slightly flexible, but inelastic. There maybe a slight yellow or iridescent tarnish present. Crystals are usually striated and have some sectility. Associated Minerals are numerous and include gold, bismuth, bismutite, quartz, andradite, chrysoberyl, almandine, barite, scheelite, pyrophyllite, kettnerite, wulfenite, gadolinite, wolframite, beryl, epidote, microcline, pyrite, chalcopyrite, arsenopyrite, covellite and several other sulfides. Notable Occurrences are many and include Cornwall, England; Bolivia; Australia; Temiscaming County, Quebec, Canada; Guanajuato, Mexico; Brazil; Kingsgate, New South Wales, Australia and some excellent locations in Vogtland and Siegerland, Germany. From the United States there are several localities in Haddam, Connecticut; Beaver County, Utah; Kern County, California; several counties in Arizona and in Boulder County, Colorado. Best Field Indicators are crystal habit, density, tarnish, softness and flexibility.